The iconic Oxford Playhouse was home to several Jazz Festivals in the early 90s. This time the Jazz Festival (which receives no subsidy) co-hosted this extraordinary band with the theatre itself. Charlie Parker and the be-boppers wrote new tunes to the chord sequences of well-known popular songs. 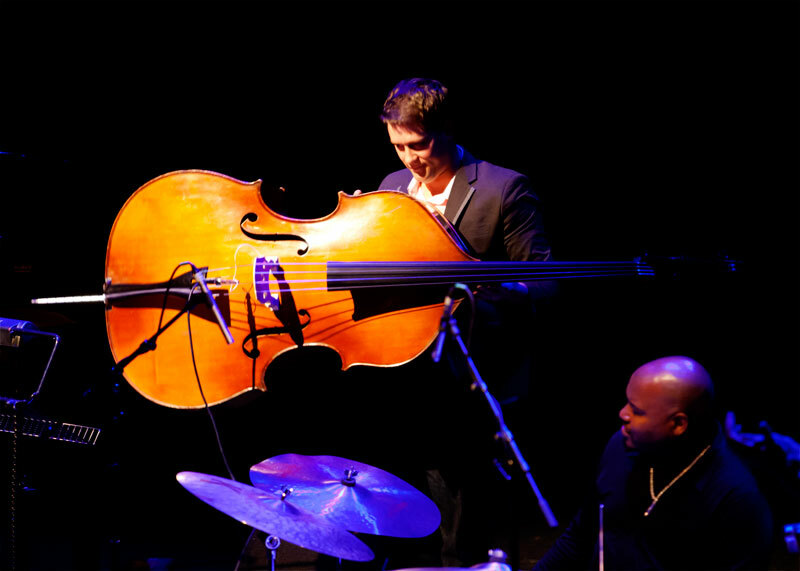 The New York Standards Quartet put new chord sequences behind the melodies of well-known jazz standards. Part of the pleasure was hearing fragments of the melodies emerging: the chords made perfect sense but took the melodies to unexpected places. Instead of using more conventional cadences, the music moved between tense modes and bright reassuring ones. From the start we were swept up by the breathtaking virtuosity of these musicians. How High the Moon was unusually in a minor mode, and I Love You moved from a funky 7/4 riff into David Berkman's beautiful piano solo, cushioned on effortless swing. The patterns of his solos were not just abstract but emotional too. In Blue in Green's dreamy mood and in Tim Armacost's sweet soprano solo, Herbie Hancock's album River came to mind. Ornette Coleman's Turnaround began with everyone playing the last 4 bars of the melody, overlapping and riffing freely in Prime Time-style, moving into a slowish blues that Tim Armacost later called an 'adult tempo!' Tim Armacost's warm tenor tone here reminded me of Joe Henderson (and a hint of Phil Woods' throatiness?) His solos were modal and chromatic , but with something of Sonny Rollins in the rhythm. Giant Steps shifted between 4/4 and 7/4, showing the amazing rapport between all the musicians . In Secret Love, the interplay between Michael Janisch's strong bass and Gene Jackson's drums was magical- when the shifting freeform grooves settled into swing, it was mesmerising. The bass solo was like a dramatic, rhythmic partita. Desafinado's changing keys and Tim Armacost's exquisite flute recalled Toninho Horta's music. All the Things You Are and Summer Night had exciting polyrhythms from Gene Jackson's drumming, erupting into driving drum rolls- we were in the presence of a master. The evening ended with a groovy gospel rock version of Old Folks recalling Keith Jarrett, with Tim Armacost playing bluesy growls. The band had charmed and engaged us all with their total focus on their art- and their sense of humour! It was a wonderful start to their major UK tour.